Thanks to Emiliano Santalucia official Facebook account we have our first Sneak Peek of Pop Culture Shock Small Scale (10″-12″) G1 Optimus Prime Statue. We had previously reported that Pop Culture Shock acquired Hasbro License to manufacture statues based on Transformers Franchise. 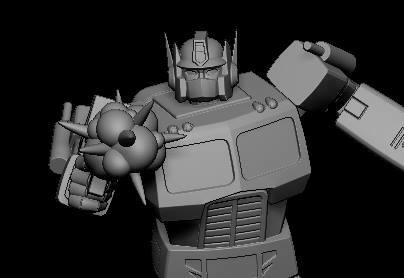 So far, it has been unknown which character will be offered or any look of the statues, but now we get a look at an Optimus Prime render in a great G1 cartoon style who is shooting his iconic weapon featuring a blast of energy. Don’t wait more and click on the bar to see the mirrored image and then let us know what you think at the 2005 Boards! First of all, we would like to thank all of our great fans and customers! Everything we do, we do for the passion of our fans and for the love of the hobby as we are collectors as well. Without you, none of this is possible and we appreciate your unwavering support. We have made a lot of changes over the last nine months. We have changed our production process as well as moved to new factories. This has allowed us to catch up on delayed statues as well as increase our product quality as evident by the recent releases of Ryu 1:3, Conan 1:3 and Zangief Ultra, just to name a few. We moved the company to Charlotte, NC and launched our very successful Facebook Group for our fans to gather and discuss PCS collectibles as a community. Also, we completely redesigned our website. Now, all this is great, but we have also had a few challenges. At the end of 2016, we successfully completed production on 10 statues and they all shipped to our warehouse in the US in December 2017/January 2018. Our intent was to schedule one statue per week, so we would have the capacity to unload the containers. A great plan but U.S. customs had other plans. Almost all the containers were held for inspection. Some were held for a couple of weeks, some well over a month. This caused us to have multiple containers arriving to our warehouse every day for two weeks. The whole team participated in unloading the containers, which caused delays in shipping and customer service. Around the end of March, due to circumstances outside of our control, we lost a customer service representative. Although we were able hire another representative in mid-April, it takes time for a new hire to learn about or product and customers. This Company was built on delivering 1-2 statues per month, not 10 statues. This combination caused us to get extremely behind on customer service. We deeply regret this current inconvenience to our customers, as it is not in line with our own expectations for our company. So, what have we learned? We are great at making awesome statues and collectibles. Alternatively, we have struggled with customer service and shipping. What do you do when you are great at art, want to focus on the art, yet still make sure our amazing fans have a great overall experience including customer service and shipping? In our case, the answer was to partner with those who have mastered the process and have excelled at it for years. At this time, we are pleased to announce that PCS Collectibles has come to an agreement with Sideshow. Sideshow is the industry leader in direct to customer sales, distribution, customer support, and shipping, just to name a few. Not only has Sideshow been a leader in our industry, they have been a great partner to PCS – taking a personal interest in our success. Starting in July, Sideshow will become the online and global distributor of PCS collectibles on their website Sideshow.com. Well, to start, future pre-orders and remaining in-stock items are now available directly on Sideshow’s website. PCS will be shutting down the ability to order from our current website shortly. The first items you will see launched exclusively at Sideshow will be the WWE Ultimate Warrior, Ryu Ultra and FINALLY 1:6 scale Street Fighter figures to name a few. You will be able to RSVP for those items during SDCC at Sideshow.com. Once this process is complete, information on your open orders will be made available through Sideshow.com. Amongst the many advantages of shopping with Sideshow, you will finally be able to see all of your pre-orders online as well as use and earn reward points on PCS items! You will be able to call, email and chat with Sideshow for questions concerning your existing and new orders. Sideshow’s 20+ Customer Support staff are available every weekday from 6am to 6pm PST – yes, that is 12 hours a day! I know this might be a lot to process, but we feel this is the best way to give our fans the greatest experience possible. You don’t buy just the collectibles, you also buy the experience. The experience extends from the rush you get when preordering that special piece, to talking to customer support, to the joy of opening the long-awaited item when it arrives with that new statue smell. You will still get the same great quality and products from PCS while getting the great customer experience from Sideshow. This will also allow PCS to go back to what we do best, focusing on making cool collectibles! More details to come as we approach the July transition. Its funny how I despise the cartoon aesthetic in the MP line but as a statue? I'm there. Can never have too many Optimuses/Optimi! And oh, don't worry, version 3.0 is coming (and we'll be drooling over him this weekend)! I was just teasing JoeHavok for refusing to believe it existed, haha. I am most excited. I can't wait 2-4 days now well have that information and pics. It's gonna be like when Takara showed off MP-09 Rodimus Convoy isn't it? Where they have it on a table in front of crowd with some close up cameras too. 1st off, well put on your reply about the 2, so far in production, Masterpiece Optimus Primes. But why are you talking about OP v3.0 in this thread? V3.0 already has its own thread. If you don't like non-transformable statues then just skip this one altogether. MP-01 will always be spectacular. I'd probably say he's the better robot (those pistons!! So cool) while MP-10 is the better overall transformer, with a much more successful alt mode. But I love them both! And yeah, they're both way more interesting than a non-transformable statue. That is some climate change denier-level stubbornness right there. The rest of us will be ogling the pics of Optimus 3.0 from the Tokyo Toy Show this weekend… but be careful, it's probably a hoax. He looks straight out of the Devastation game. Too bad we can't get a transforming figure with level of awesome cel shading. I really like the look of this and think it is priced well. Definitely would consider buyng it, but it's not available for another 12 months Why such a long delay??!! Still can’t unsee the mustache. MP-01 Optimus Prime. Still my favorite Transformer toy to this day. IMO, its SO much better then MP-10! The articulation range alone, blows it out of the water. The hefty feel & the features. I have a Japanese original 2003 version, one MISB, as well as a Transformers 20th Anniversary 2004 USA "battle damaged" version . And I like my MP-10 just fine it's just not as good of a robot (again, in my opinion). Sorry, it’s still just rumor and speculation. That could just be photos of MP-10 anime version, or a MP Powermaster Prime. Please see my response above. Rumor. Is it still funny that I’m right though? Still just rumor. Nothing has been announced yet. Not feeling it, the hips totally ruin it for me, but the arms seem disproportionately small and the cell shading look kinda overdone and tacky ~ i get what they were going for, but in trying to make it look like cheap animation… it looks like cheap animation. the torso, lower legs and head are nice enoughly sculpted. The first in a line of all new collectibles depicting the AUTOBOTS and DECEPTICONS as they first appeared in the classic animated series THE TRANSFORMERS, this line will feature meticulously detailed paint applications to recreate the look of the animated series as it’s never been done before. AVAILABLE FOR PRE-ORDER JUNE 4, 2018@ 3PM PST. I think it looks OK and I'm not into statues at all. But the base clashes with the rest. It should be either cell-shaded or made to look like a painted cartoon background. Or like those light grid backgrounds from the G1 packaging and the cartoon openings. My head would explode if I saw any on my Transformers in the trash. You must be very forgiving. Not very. I'd probably #### someone if they took my 200 + uhaul boxes of Transformers. I'd hunt them down and get them back. But my.family didnt make it easy that's for sure. I am a naturally understanding guy but don't #### with my toys yaknowhaimean?